Western blot analysis of extracts from NIH/3T3 cells, using Phospho-Src (Tyr527) Antibody (A,B) or v-Src antibody (C,D). The phospho-specificity of the antibody was confirmed by treating the membrane with calf intestinal alkaline phosphatase (CIP) (B,D) after Western transfer. 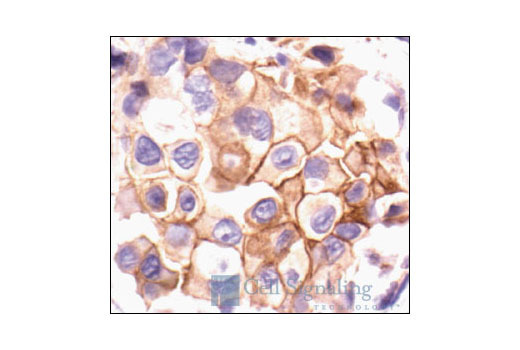 Immunohistochemical analysis of paraffin-embedded human breast carcinoma, showing membrane and cytoplasmic localization using Phospho-Src (Tyr527) Antibody. 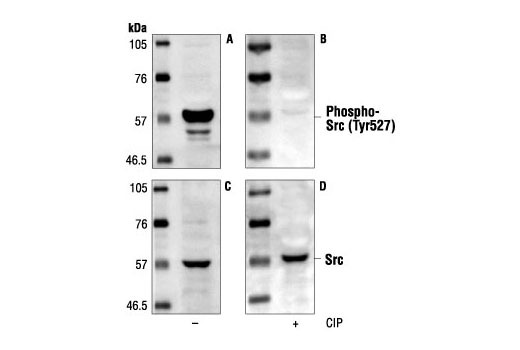 Phospho-Src (Tyr527) Antibody detects endogenous levels of Src only when phosphorylated at Tyr527. The antibody may cross-react with other Src family members such as Yes, Fyn, Fgr and Yrk when phosphorylated at the equivalent sites. Polyclonal antibodies are produced by immunizing animals with a synthetic phosphopeptide corresponding to residues surrounding Tyr530 of human Src. Antibodies are purified by protein A and peptide affinity chromatography.